When you choose our Bebe Coterie Baby Plan, you will be welcomed into our indoor or outdoor studio at various stages over the course of your baby’s first year. In essence, we are forming a partnership with you to capture your growing family. During your baby’s first 7 days of life, through the first time she lifts her head or sits up alone to those first real steps, we will custom design each session for select clients who want to capture these moments in time – and preserve heirloom treasures that will be a joy to view for decades to come. We specialize in Artistic Newborn Baby Photography and Creative Pregnancy Photography. Why not capture the emotion of this special time of your life with a maternity portrait session, too? 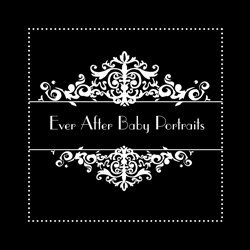 Fine Art portraits of your cherished baby as a Newborn, 6- to 8-month (sitting), and 12-month (standing/walking) baby with custom, one of a kind photography. Our Beginnings Session is held when your baby is sitting up without assistance. Our Newborn Portrait Session is best held before the baby is 8 days old. This session should include Mom and/or Dad. The Newborn Photography Session provides parents with beautiful images from the child’s most fleeting time of life. Our one-year Freedom Session includes the whole family - be sure to invite the grandparents! The baby should be standing without support – it is wonderful if the baby is walking or can take a few steps. who dwell within its walls! What do you want your home to say about you? Want to learn more about Family Portraits? We can’t stop time! That’s why parents commission Ever After to create beautiful heirloom portraits of their children and family so they can decorate their home with the ones they love. Your moments...forever. FREE article "TOP 10 Mistakes New Parents Make - and How to Avoid Them!"